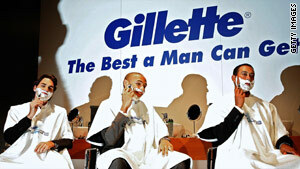 Tiger Woods, right, has been an ambassador for Gillette since 2007. London, England (CNN) -- Tiger Woods' marital "transgressions" may have cast doubt on the future of his corporate associations, but history shows that a dose of bad publicity does not always mean an end to the earning power of sport stars. The world's No. 1 golfer has not been seen in advertisements on American television since November 29 according to media research company Nielsen, with the blackout starting just two days after he crashed his car outside his house -- reportedly following an argument with his wife. But Nigel Currie, director of international sponsorship agency BrandRapport, believes that although Woods faces an uncertain corporate future, his marketability will remain if he thinks creatively. "It all depends on how long the story will stay on the front page. A story like this makes sponsors very nervous because they don't know if there's more to come," he told CNN. "Most companies will have a morality clause as part of the contract with a big name like Woods. This is usually enforced because of drugs [or criminal issues], but in a situation like this which is ongoing, there's a good chance these companies will exercise their rights and jump ship." However, while Woods --, the first sportsman to earn $1 billion -- might possibly lose some sponsors, other revenue streams could be exploited, according to Currie. Will Tiger Woods return to golf the same? "This chink in his armor won't impact his earning capacity, but companies and brands will think differently in the future. It will open up new offers and close a few doors too," he said. While golf is traditionally a very conservative sport which attracts like minded backers, it is still possible to bring in sponsors even in cases as extreme as John Daly -- whose drinking, smoking and eating problems put his career at risk. Daly's less than wholesome image paid dividends in 2005 when the American teamed up with restaurant chain Hooters, known for its scantily-clad waitresses, in what seemed a mutually beneficial arrangement. Hooters vice-president Mike McNeil said in a statement on Daly's Web site: "John is unique, successful and a man of the people who doesn't really worry too much about what the establishment thinks. In fact he's a lot like Hooters." But the appeal of Daly's carefree attitude also proved to be his downfall when, in November 2008, the golfer was found drunk and face down in a flower bed outside a Hooters restaurant. Earlier this year, Hooters quietly relinquished their contract with the colorful, larger-than-life character. Another player who has successfully surfed the wave of marketing and endorsement despite a checkered personal life is European golfing legend Nick Faldo. Despite two divorces and a number of well-documented affairs -- including a three-year liaison with 20-year-old Brenna Cepelak which ended famously with the American student battering Faldo's Porsche with a golf club -- sponsorship has never eluded the golfer. Faldo also went on to cement his position among the game's elite when he captained the European Ryder Cup team in 2008. Time will tell if Tiger Woods' self-confessed "personal failings" will impact on his career, but his world-beating marketability may have to undergo some change. Is snoring affecting your handicap?